i thought i should do a comparison of some of the taupes i've used lately, to show y'all the difference :) i find comparison posts really helpful on other blogs, so i think i should do some more on mine, it's only right yeah? 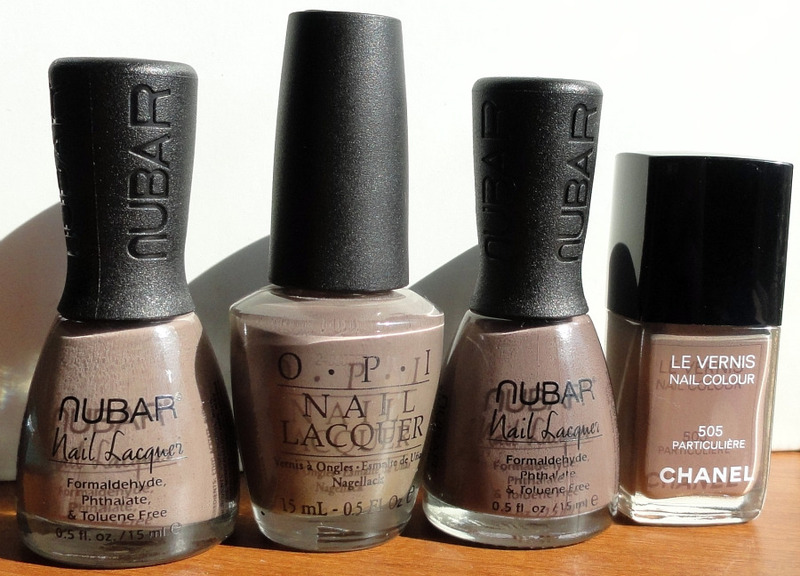 nubar's newest collection has two taupes so now is as good a time as ever to show some similar ones so you can see if you want or need them. marabout is very similar to opi's you don't know jacques and chiffon is similar to chanel's paticuliere. you don't know jacques is the most brown, paticuliere is the lightest and most tan. chiffon and marabout are more grey, with marabout being the darker and richer color. i personally like them all but i think ydkj looks the best on me. what is your favorite taupe? some of these products were sent to me. please see disclosure statement for more information.